← Feisty Female YA Tournament 2013 – Winner Announced! My Friday Finds this week was discovered when a Twitter friend asked if I would be interested in reading his book. It looks very promising so I agreed. It isn’t Young Adult, but I am always open to new adventures in reading. I will post a review when finished. Find the killer, restore your father’s legacy, save the world…all before finals week. Germany, 1945. Nazi leaders scramble to hide stolen wealth from Allied invaders. Among them are members of the German Christian Church, the spiritual arm of Hitler’s empire. When an American soldier stumbles upon the Church’s loot, he learns of the master plan to resurrect the Nazi regime—when the time is right. But the solider dies in action just days before war’s end. The secret, lost. Virginia, Present Day. A Senator’s home has been consumed by inferno. The nation mourns the loss of a beloved statesman until painful questions are asked. Was it arson? Or the instrument of suicide? The late Senator’s son Max Meyers refuses to believe the FBI’s ruling. Joined by his astute professor Charles Kensington and renegade law enforcer James Russell, Max forsakes posh campus life to learn the truth. A forgotten letter sent by Max’s great-grandfather from the carnage of World War II provides a clue, lighting a trail of decades-old conspiracy across Europe. 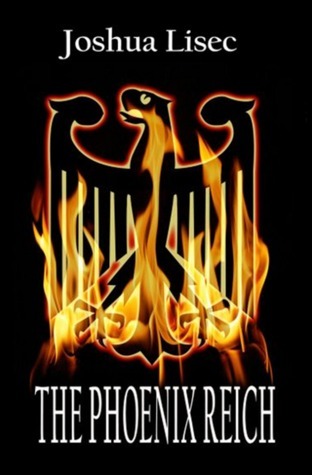 A lost faction of Nazi religious leaders has risen from the ashes of a failed Reich, prepared to revive a government of tyrants built to last a thousand years. To keep the promise of justice made to his late father, Max must prevent the conspirators from unleashing vengeance on an unsuspecting continent. Is modern Europe’s fate sealed? This entry was posted in Friday Finds and tagged Cynthia Stacey, Friday Finds, Joshua Lisec, The Phoenix Reich. Bookmark the permalink.